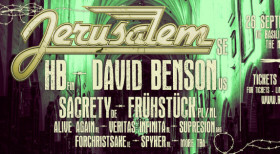 Jerusalem will be playing on Rock Valley Festival September 26. Check out the teaser for the event here! 3 Responses to "Jerusalem, Holland 26 September"
It’s the best time to make some plans for the future and it’s time to be happy. I have read this publish and if I may I wish to recommend you few fascinating issues or suggestions. Maybe you could write next articles regarding this article. I want to learn even more things about it!